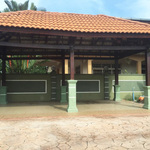 A bungalow situated in a residential area at Taman Rambai Utama, Melaka. Our homestay is built in Balinese style, notably comes with a mini swimming pool. Very spacious house with Balinese concept, Gazebo and nice garden for outdoor activities such as BBQ time and Tele-match within your family members. Air-conditioning in bedrooms, living and dining area. Convenient for families, friends and schoolmate gatherings/trips. Very close to Klebang Beach and just a few minutes drive to famous Jonker Walk. Ideal place to enjoy a very relaxing time with family and friends and to visit the famous historic sites of beautiful Melaka. Access Private Mini Swimming pool for 24 hours. Dining hall with big dining table and access to garden for relaxation and BBQ (grill and BBQ equipment provided). The house can accommodate large groups between 10-15 person in one time and extra pillow are provided. * Refundable safety deposit of RM50 dan Cleening Fee rm50 is required upon check in.